Saving for a house deposit? 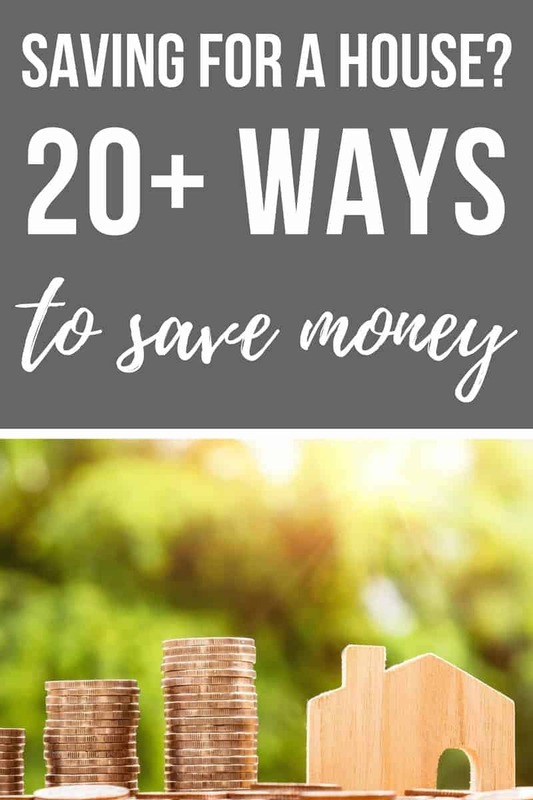 Here's 20+ you can save more money! Are you saving for a house deposit? When you’re trying to save to buy a house, it can feel so daunting and overwhelming. Here’s 20+ ways you can save more money to put in your piggy bank. If you’re serious about saving money, you’re going to love these frugal living tips! One of our big financial goals as a couple ever since we got married was to buy a house. It was something that was really important to us and we started saving for a house deposit right away. It wasn’t easy or fun, but we were able to buy our first home (a real fixer upper) when we were 25 years old. In fact, by using these 20+ creative ways to save more money, we were able to buy a 2nd house (yet again, another fixer upper) before we turned 30! Honestly, those are two things that I never thought were going to be possible. 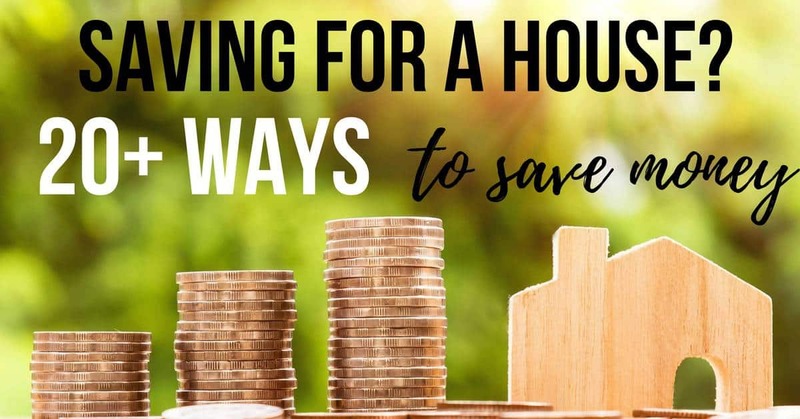 I don’t tell you this to brag or to get a pat on the back, but to prove to you that by incorporating simple frugal living tips into your life, you can slowly chip away while saving for a house deposit. Every penny counts! Simply changing your financial mindset and learning to live with less is the first step and best way to save for a mortgage. 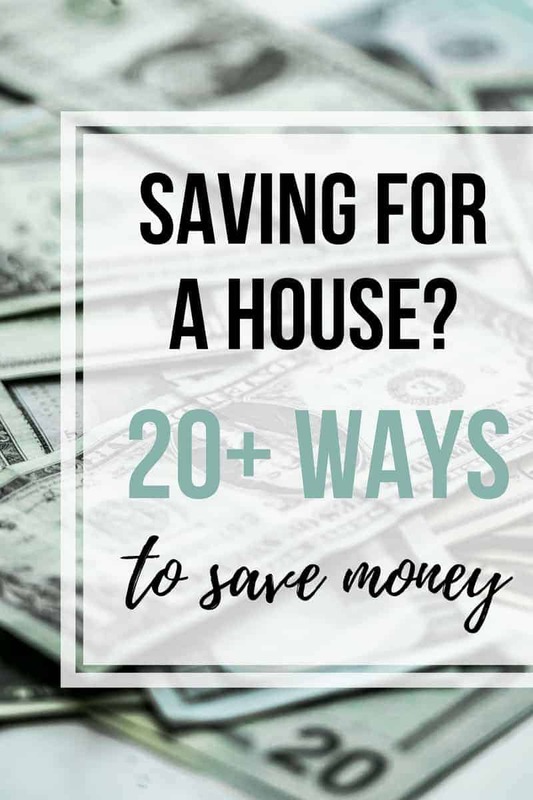 These other 20+ ways to save more money will help you take the steps closer to home ownership with every dollar saved! Are you ready to see these 20+ ways to save money when saving for a house deposit? First and foremost…get rid of debt! One thing that can REALLY hold you back from saving up for a house is if you already have a large amount of debt (either from student loans, credit cards, car loans, etc.). Now this is not a post about ways to get rid of debt, but before we move onto the other frugal living tips I wanted to start with this. When you are starting saving up a house, you really want to find ways to get rid of or pay down your existing debt. This will make a HUGE difference if you are saving for a house deposit. Every time you are able to get rid of debt, get in the habit of putting that money directly into your savings for the down payment! Looking for ways to get rid of debt? Entertainment costs can really add up if you’re not careful! But there are tons of free local events if you take the time to look for them. Check out your town’s website for an event calendar and look on Facebook events for good options. Bonus money saving tip: Eat at home before the event or bring your own grub to when you’re saving for a house deposit! Ditch the cable bill to save more money. Did you know the average cable bill in the U.S. is $103 per month?? That means you can save $1,236 a year by getting rid of cable TV (that actually means that Logan and I have saved over $6,000 in just 5 years of marriage without cable!). That money can make a huge difference when you’re saving for a house deposit! We use Netflix and Hulu instead, which are smaller monthly fees at $10.99 and $7.99 respectively. We also use Amazon Prime Video, which is included with our Prime membership costs. Honestly, we don’t miss it at all….except during football season. If you’re needing to watch live sports, you can go over to a friend’s house or to a restaurant. Keep your home’s heating turned lower. You can actually save 3% of your heating bill for every degree under 70 that you turn your heating to. We keeps ours set between 66-68 degrees. That may seem cold for some but, we use blankets or sweaters if we feel cold (and we’ve got a gas fireplace in the new home’s living room, which is where we spend most of our time so it’s usually more toasty in there). But seriously, who doesn’t like getting cozy with blankets and jammies all the time anyway? Bonus tip: Check out this article for other creative ways to save money your heating bill! I realize this may not be possible for everyone, but there are a lot of financial benefits from working at home! You’ll save more money (and time) by not commuting, not eating out for lunch and there are a lot of home office tax write offs to take advantage of. Buy used whenever possible when you’re saving for a house deposit. There are so many different things you can buy used…not just the obvious like….cars, home decor, furniture, baby items, or even gently used clothing…but what about technology? I saved hundreds of dollars by buying my camera used on Amazon and lens refurbished on Adorama online when we were saving for a house deposit. Tools, wedding dresses and musical instruments are just some other unique ideas of things to buy second hand to save more money. Upcycle things from thrift stores. There are so many awesome ideas of things you can upcycle and repurpose from thrift stores to save more money. I’ve even gotten things for free that people were going to take to the dump! If you’re needing some inspiration, check out how I turned these old chairs into a colorful outdoor bench or how this rusty old lug wrench helped make this DIY farmhouse sign. Save up for all cash purchases. All of those credit card offers or financing opportunities can definitely be tempting, but one of the best ways to save money is to save up so you can afford all cash purchases for larger items like appliances or furniture. That way, you can avoid the interest payments altogether. For the largest items like cars or home purchases that require you to get a loan, save up for the largest down payment possible to lower the amount of interest paid. I know this can be hard when you’re saving for a house deposit. You want to just get the minimum possible amount, so you can finally buy a house. But you’ll be much better off if you can save up a little longer for a larger down payment on the house. I get it, this is a little bit of a weird way to save more money! But, we noticed a big difference in the cost of living when we moved to a smaller town from the big city. Rent and home prices are cheaper in smaller towns. Even things like restaurant prices and grocery store prices are slightly better. Even if you’re tied to a large city, you can save typically save more money by moving out to the suburbs. Finding low cost hobbies is an excellent way to be frugal when you’re saving up for a house. Here’s 10 good ideas for hobbies that take no or little money to start. DIYing is one hobby that can save you lots of money. More specifically, we took up pallet furniture and decor building. We’re able to get the pallets for free most of the time! Check out all of our pallet projects here. Go 6+ months between hair cuts. I typically wait at least 6 months between hair cuts to keep more money in my pocket. My hair stays surprisingly healthy because I try to avoid using heat styling when it’s not needed. I don’t need to straighten my hair everyday because I work from home. I try to take showers at night so my hair can dry naturally too. Bonus tip: You can save tons of money by not coloring your hair either. If you must, do it from home. Keep monthly bills as low as possible. Don’t sign up for monthly subscriptions (like newspapers, magazines and subscription boxes). Save up and pay up front when we can, rather than taking financing options. Planning your week out in advance is a great habit to start when you’re saving up for a house..more specifically, meal planning! You’ll be able to take advantage of the food you already have by scheduling meals and budget for eating out. If you plan out your meals in advance, you will have less of those “what’s for dinner….I don’t know what to make….let’s go out” kind of days. You know the kind, right? This is the command center that we use on our fridge to to plan our week and meals. While you’re saving for a house deposit, you’ll probably have to live below your means for a while. Just because you can rent a 3 bedroom apartment, do you really need it or could you make a 2 bedroom work? Just because you can afford the new truck, do you really it or could you buy something used? Always keeping your big WHY in mind helps as you “suffer” a bit and live below your means to save more money. The DIY movement has shown up in full force in recent years…but DIY isn’t all about home improvements or those cute crafts you see on Pinterest. You can save more money by DIYing more things around your house like….making your own DIY household cleaners, cooking your own meals, even distressing your own jeans. I know…”shopping” to save money…sounds counter-intuitive, right? You can definitely save more money by shopping online because you are easily able to compare stores and find the lowest price possible. I love the Google Shopping tab. If you’re a pro at online shopping, you’ve probably already figured out that the annual fee for Amazon Prime totally pays off because you always get free shipping. You can find almost everything you need on Amazon! You may be tempted to avoid getting your car serviced when you’re saving for a house deposit. Even though it can be a bummer shelling out your hard earned money on something boring like getting your oil changed, it’s well worth it. Keeping your car maintained and serviced regularly can help prevent big ticket bills for your car and unexpected costs and will help your car run longer. Being aware of where every cent of your money is going is one of the best ways to save money for a mortgage. With knowledge comes power. When you know that you’re spending $50 a month buying vanilla lattes, you’ll likely go less often once you know what a drain it is on your budget. Tracking your expenses allows you to identify the high budget items so you know where to focus on saving for a house deposit. Wait for movies to come out instead of going to the theaters. Get your movies on RedBox or watch through NetFlix / Amazon Prime, rather than buying DVDs. Use Pandora or Spotify to get free music. Wear your clothes out and go with less. According to Forbes, the average American woman has over 30 outfits. In 1930, that number was only nine! We have definitely become a society obsessed with more, more, more. In the process, we’ve probably been collecting wayyyyyy too many clothes. Instead of buying new clothes on a regular basis, try waiting until your clothes are actually all the way worn out…which usually takes quite a while. Bonus tip: You can make some extra cash to when you’re saving up for a house by selling all those extra clothes on Facebook Buy/Sell groups! Start with the new ones or name brands. Buy gender neutral baby items and use hand-me-downs. Newsflash, kids are EXPENSIVE. It can be even harder to save money when you’ve got little ones running around. You can save tons of money by only buying gender neutral baby items (especially the big stuff like nursery furniture, strollers, car seats, etc.). These will likely be able to get more use out of them than just one kid. Bonus tip: When it comes to clothes, you can exchange hand-me-downs with other friends and family! Saving up for a house can definitely feel overwhelming and daunting. In fact, you may be so discouraged that you’re on the verge of giving up your home ownership dreams entirely. Remember, start with getting rid (or reducing) your existing debt. Next, change your mindset and figure out ways to live with less. 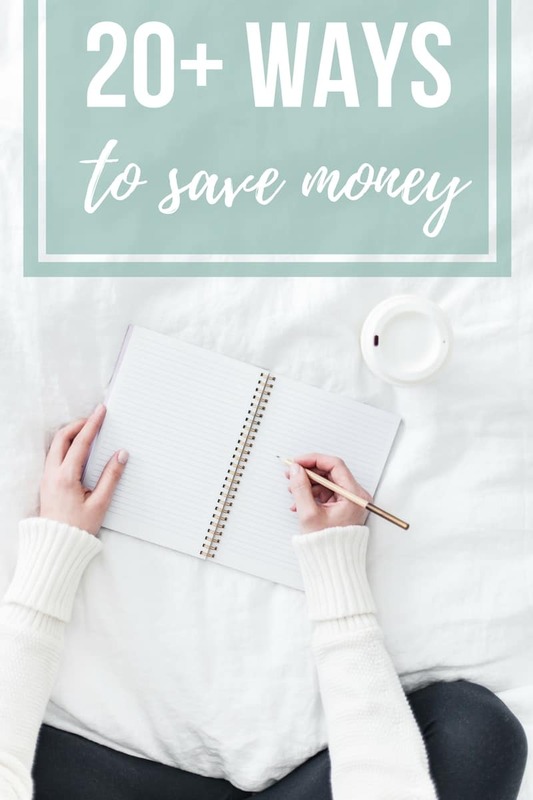 I’m here to tell you that by simply incorporating several frugal living tips you can save more money than you ever thought possible. What other ways do you save money? Let me to know in the comments below! !